The Department of Neurology at the University of Florida offers a one-year fellowship in Clinical Neurophysiology. Two positions are available, one with EEG/Epilepsy emphasis and the other with EMG/Neuromuscular emphasis. Both positions are accredited by the ACGME, and fellows who successfully complete the fellowship are eligible to take the Clinical Neurophysiology Exam offered by the American Board of Psychiatry and Neurology in addition to the American Board of Clinical Neurophysiology (EEG track) or the American Board of Electrodiagnostic Medicine (EMG track). Applicants must have successfully completed an adult or pediatric neurology residency in the United States. The EEG track fellowship consists of twelve months of training and includes three weeks of vacation. The goals of the fellowship are to develop competence in various aspects of clinical neurophysiology with a special focus on clinical epilepsy, video-EEG monitoring, epilepsy surgery and related procedures, electroencephalography and evoked potentials. The year is divided into nine months of EEG/Epilepsy, two months of EMG/Neuromuscular Diseases, and one month of Sleep Medicine and intraoperative monitoring. 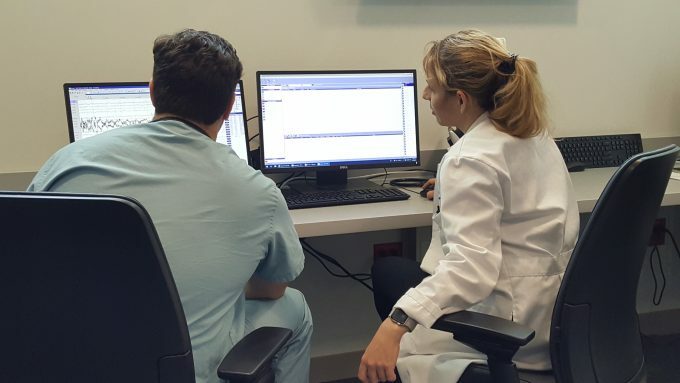 During the EEG/Epilepsy rotation, fellows are fully involved in the presurgical evaluation of patients with intractable epilepsy, assist in patient care, interpret video-EEGs, and perform Wada tests and intraoperative electrocorticography. In addition, fellows attend one half-day epilepsy clinic per week and interpret EEGs and evoked potentials. The EMG track fellowship consists of twelve months of training and includes three weeks of vacation. The goals of the fellowship are to develop competence in various aspects of clinical neurophysiology with a special focus on the electrodiagnosis of neuromuscular disorders. The fellow will spend nine months on the neuromuscular/EMG service and will perform electrodiagnostic studies on patients with disorders of nerve, neuromuscular junction, and muscle under close supervision of an attending neurologist with expertise in the clinical and electrodiagnostic evaluation of patients with neuromuscular disorders. The fellow will spend two months reading EEGs and evoked response studies and one month in the Sleep Medicine Clinic participating in intraoperative monitoring. Fellows in either track are encouraged to participate in the wide range of basic and clinical research opportunities available at the University of Florida. Furthermore, fellows participate in the education of medical students and neurology residents. Interview invites will be sent out following review of application materials to selected candidates. This fellowship will be offered from the academic year 2020 as an ACGME accredited, one-year program. Applicants must have successfully completed an adult or pediatric neurology residency in the United States. The program will designed to provide advanced training in Epilepsy and Electroencephalography for candidates without or with prior fellowship training in Clinical Neurophysiology (i.e., a 2 year combined program). The Fellowship will provide knowledge and skills in the diagnostic evaluation and management of all patients with epilepsy. The trainee will become proficient in all aspects of diagnostic neurophysiologic evaluations, such as routine and prolonged outpatient and inpatient video-EEG recordings in the ICU and the EMU including intracranial monitoring, stereo EEG planning and interpretation, and brain stimulation mapping. Training will also include exposure to advanced epilepsy-oriented neuroimaging (MRI, fMRI, PET, SPECT), neuropsychology evaluation (including Wada testing) and outpatient practice. Rotations in pediatric epilepsy will be provided. The fellowship will offer a structured educational curriculum with ample opportunity for clinical and translational research. Clinical time will be split between the University of Florida Shands Hospital and VA hospital. Rotations include outpatient clinic, Epilepsy Monitoring Unit, long term video-EEG monitoring, and research/elective.The University of Florida serves as the major tertiary referral center for northern and central Florida. Fellows will therefore gain significant experience of complex adult and pediatric epilepsy and will be well–prepared to qualify for the ABPN Epilepsy Board Certification. Research opportunities abound in all fields relevant to clinical epilepsy – e.g. pharmacology, electrophysiology, imaging, health outcome, epidemiology and descriptive case series. Candidates interested in translational and neuroscience-oriented research are invited to visit the UF Wilder Center for Epilepsy Research. Weekly didactic conferences including multidisciplinary Epilepsy Management Conference, multidisciplinary SEEG/intracranial EEG conference, neurology resident noon conference, departmental grand rounds, and wide choice of other academic meetings at the University of Florida. Fellows are additionally offered the annual American Clinical Neurophysiology Society In-Service Exam. In addition, attendance and presentations at the national American Epilepsy Society and American Clinical Neurophysiology Society are encouraged.